For a non-profit tackling complex and sometimes tragic issues, good design might not seem like a priority. But for charity: water, eye-catching images are their secret to success. Most people don’t think about where their next cup of clean water is going to come from. But for 663 million — one in 10 people across the world — this basic necessity is a daily struggle. charity: water is on a mission to change that. Founded in 2006, charity: water brings clean and safe water to people in developing countries. The organization has funded over 24,500 programs for 7 million people across 24 countries to date. And they use the power of design to make it happen. ― Lauren Letta, Chief Operating Officer of charity: water. 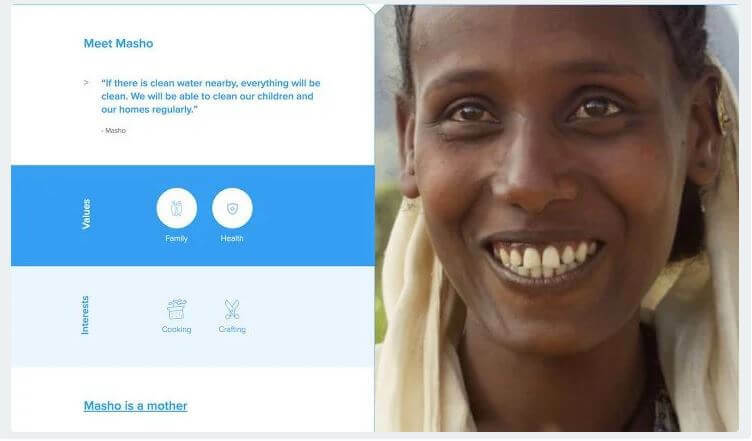 Still, while most nonprofits were sharing somber graphics that guilted donors into participating, charity: water made an early decision to take a positive approach to design. charity: water’s design team now consists of two in-house creators: Senior Designer Matt Pamer and Designer Ryan Dutch. They’re tasked with taking an issue as complex as the global water crisis and turning it into powerful images that inspire change. Here are four core strategies charity: water uses to spread hope and inspiration through design. “We wanted to change the image around charity in a way that can be filled with hope and inspiration, as opposed to despair and sadness." charity: water chooses to share the “after” picture — not the “before.” That is, they want to inspire donors and advocates by showing them exactly how their contributions can help those in need. It’s not easy to educate millions of people about the global water crisis. But charity: water has a plan. But they can’t solve that problem alone. That’s why charity: water launches high-profile campaigns to spread the word about its cause and engage its worldwide audience. For World Water Day, for instance, charity: water produced the “Someone Like You” campaign. 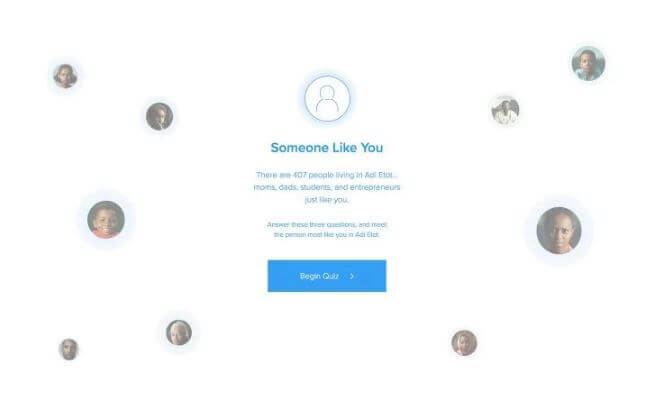 Through this campaign, they invited people to take a three-step quiz about themselves, and see who they match with in Adi Etot, a village in rural Ethiopia that was soon to get clean water. Teams traveled to Ethiopia for two weeks and met over 400 people to build this catalogue and show others just what it looks like to live without clean water. People aren’t the only subjects of these storytelling campaigns, either. In 2011, charity: water put its drilling rig “Yellow Thunder” front and center. The nonprofit invited donors to crowdsource the funding needed to build the rig, which would help dig 80 new wells and give 40,000 people access to clean water. They even created a video and microsite detailing how each part of the rig would be built and how much it would cost. This helped people know exactly where their money was going. 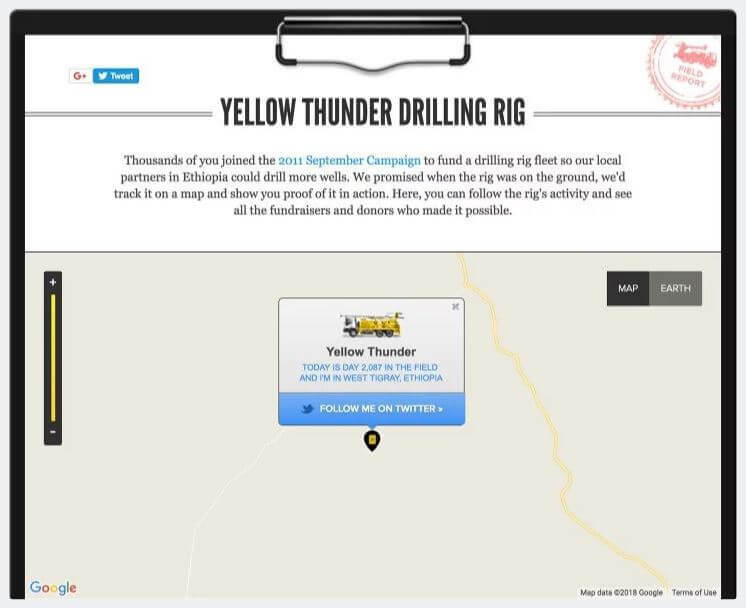 Once the rig was funded and built, charity: water invited the world to track Yellow Thunder’s journey on a map and follow it on Twitter, where it Tweets its location every time it digs a well. charity: water also takes this approach with its annual charity: ball, a black-tie affair that caps the end of each year. 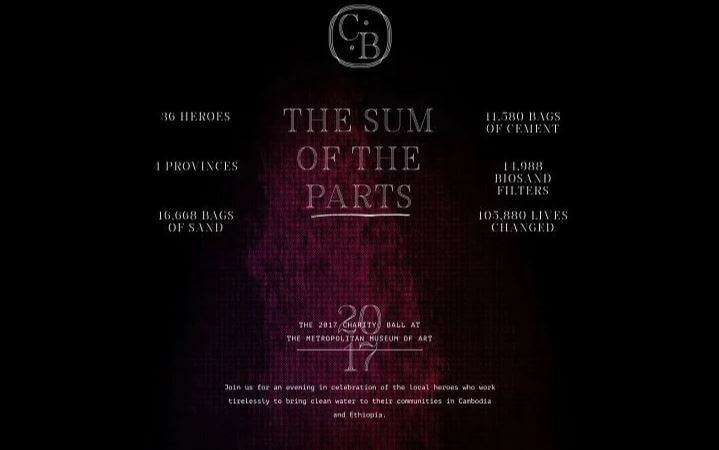 The 2017 gala — held in December at the Metropolitan Museum of Art — highlighted two indigenous organizations in Cambodia and Ethiopia. charity: water used its platform to tell the stories of the people, drillers, and teams that bring clean water to communities in these countries each day. Beyond the human emotions and stories behind charity: water’s work, there’s a web of concrete numbers and data to be shared with audiences. Take this blog graphic, for instance. It communicates the achievements of charity: water's teams of mechanics at a glance. charity: water also offers a downloadable poster that people can print or share online. 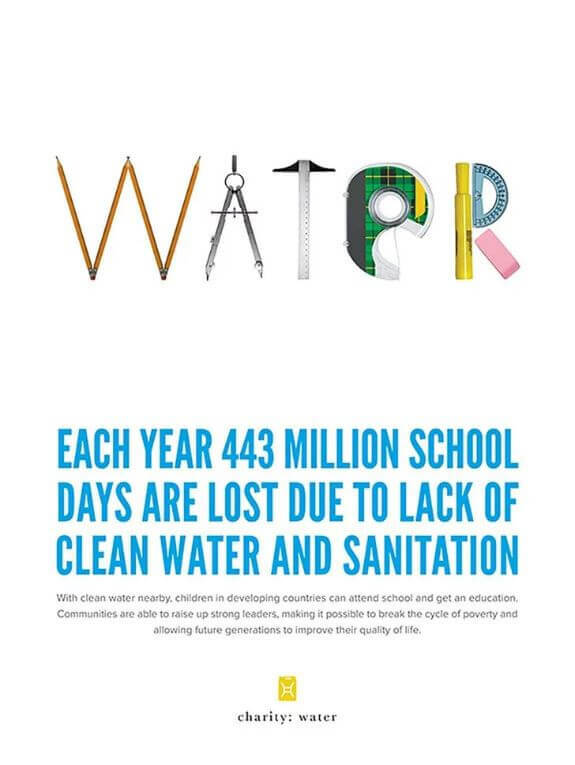 It showcases a harrowing statistic: each year, 443 million school days are lost due to lack of clean water and sanitation. But it uses bold text and engaging graphics to grab people’s attention and draw awareness to charity: water’s mission. The nonprofit even designed a series of Facebook Timeline Photos for advocates to download and place on their own sites or social platforms. When Dutch creates graphics for social media, for instance, he considers that people are probably seeing this content on their phones and tablets. So he tends to create short, easily digestible content for these mediums rather than long-form stories. 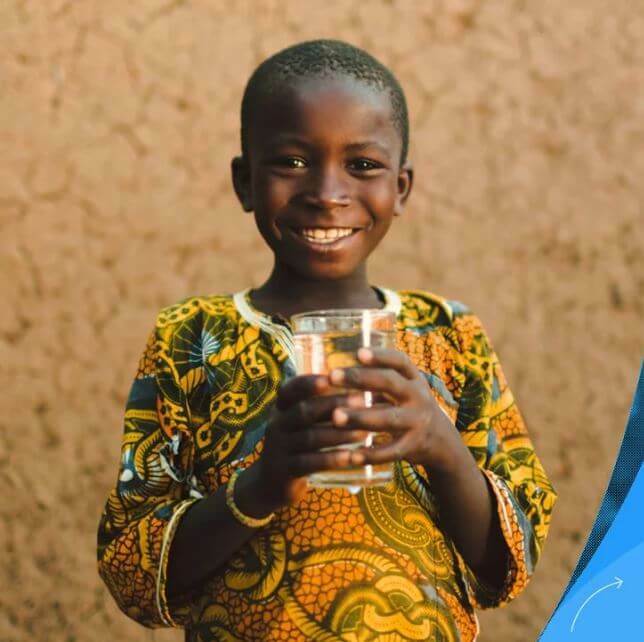 For example, charity: water released this infographic in September to celebrate 11 years of providing clean water to millions of people in need. 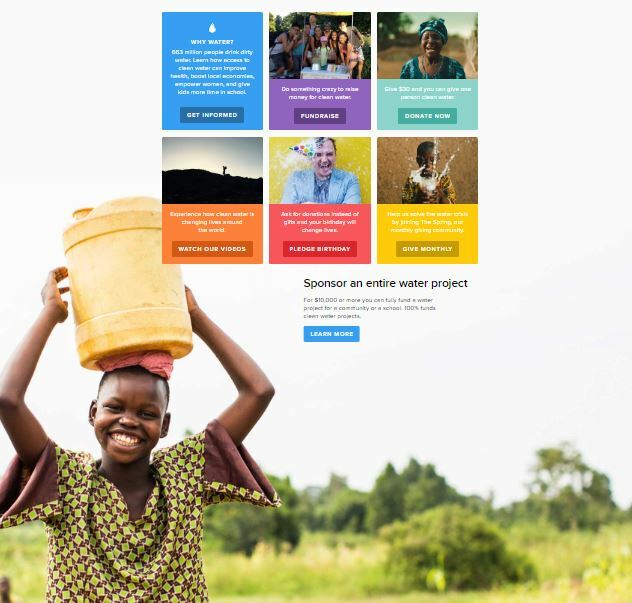 Instead of just writing, “Thanks for helping us reach 7 million people!” or drafting a long blog post about the nonprofit’s history, the designers created a timeline to showcase charity: water’s progression. It could easily be shared and consumed on social media. This doesn’t just apply to donors and advocates. It applies to charity: water’s own teams as well. Most importantly, this commitment to branding helps charity: water stand out from the noise and continue to spread hope and inspiration. What do you think of charity:water's approach in branding and designing? We would like to hear from you on @XiMnetMY. This article is written by Amanda Walgrove on Canva: How one nonprofit is changing the image of charity through design.